Los Angeles Class Attack Submarine: Laid down, 16 October 1976, at the Electric Boat Division, of General Dynamics Corp., Groton, CT.; Launched, 11 August 1979; Commissioned, USS La Jolla (SSN-701), 24 October 1981; La Jolla is assigned to the US Atlantic Fleet and is homeported at Norfolk, Virginia as of 10 November 2014. She is scheduled to be decommissioned and converted to a moored training ship, serving as a training platform for nuclear power training at Naval Support Activity Charleston in South Carolina, December 2014. 895k Commemorative covers on the occasion of La Jolla's (SSN-701) keel laying, commissioning & launching at the Electric Boat Division, of General Dynamics Corp., Groton, CT. Photos courtesy of Scott Koen & ussnewyork.com. 1.27k Eleven page PDF of La Jolla's (SSN-701) keel laying. Photos courtesy of Scott Koen & ussnewyork.com. 310k 2 page PDF of La Jolla's (SSN-701) keel laying. The keel was authenticated by Mrs. Bob Wilson, wife of Rep. Wilson of California. She also sponsored the boat. Photos courtesy of Dale Hargrave. 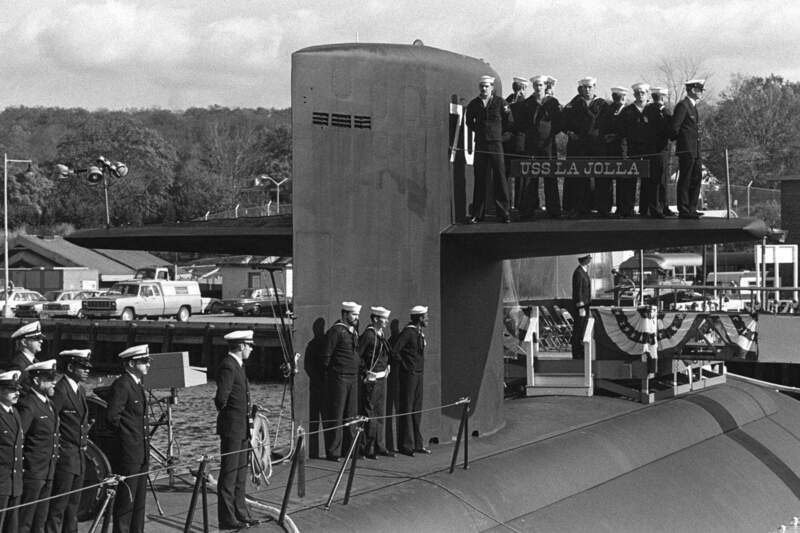 32k Officers and crew of the La Jolla (SSN-701) stand at attention as the boat slides down the shipway at the Electric Boat Division, of General Dynamics Corp., Groton, CT., 11 August 1979. USN photo courtesy of USNI. 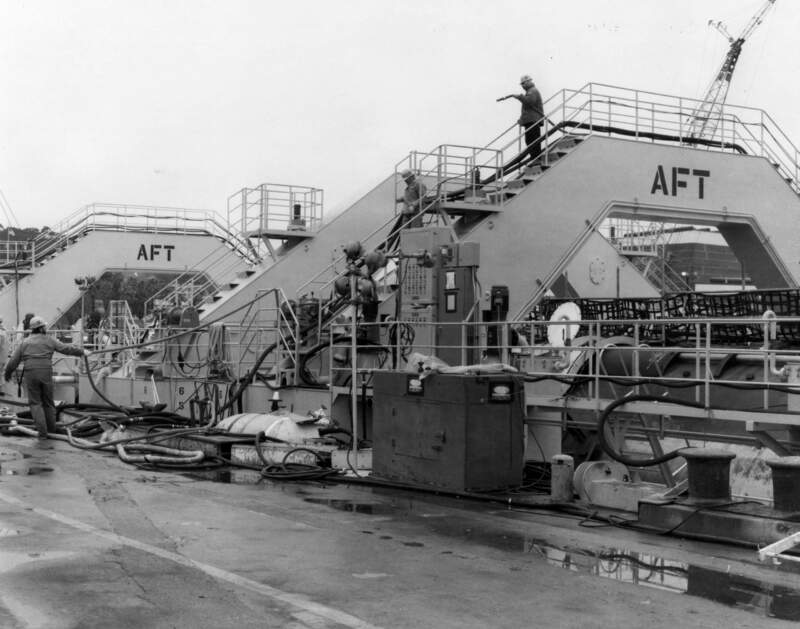 183k Crewmen stand by on the diving plane and on the deck during the commissioning of the nuclear-powered attack submarine La Jolla (SSN-701) on 24 October 1981. Photo # DN-SN-86-06784 by JO 1 Peter D. Sundberg, from the Department of Defense Still Media Collection, courtesy of dodmedia.osd.mil. & submitted by Bill Gonyo. 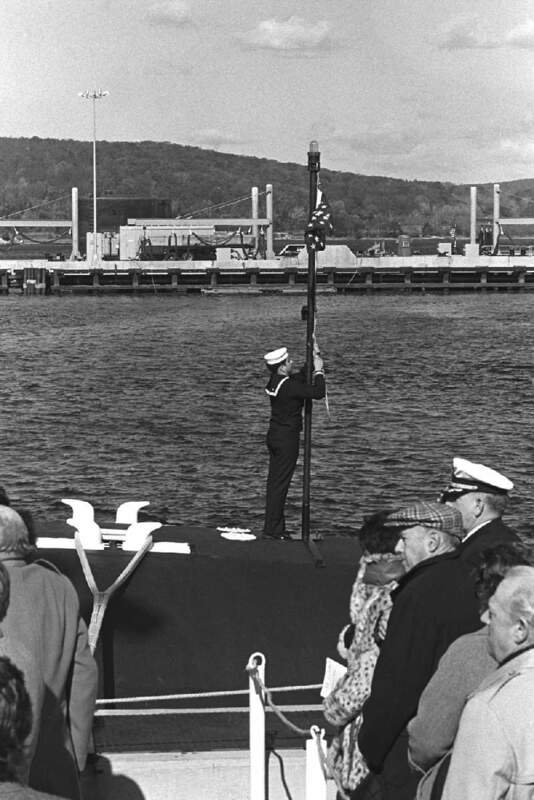 121k A crewman raises the union jack during the commissioning of the nuclear-powered attack submarine on 24 October 1981. USN photo # DN-SN-86-06760 by PHAN R.D. Feary from the Department of Defense Still Media Collection, courtesy of dodmedia.osd.mil. 218k An aerial port bow view of the nuclear-powered attack submarine La Jolla (SSN-701) underway on 1 May 1982 during her shakedown cruise off the Atlantic coast. 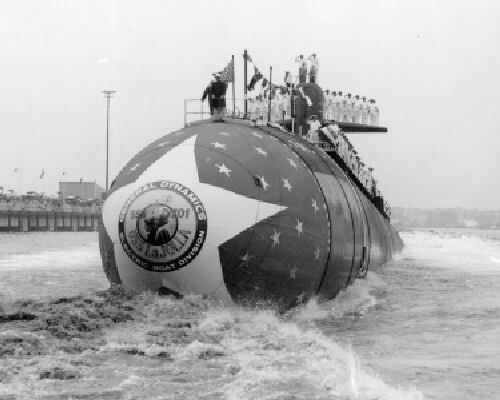 Photo # DN-SC-82-05950 by General Dynamics Electric Boat, from the Department of Defense Still Media Collection, courtesy of dodmedia.osd.mil. & submitted by Bill Gonyo. 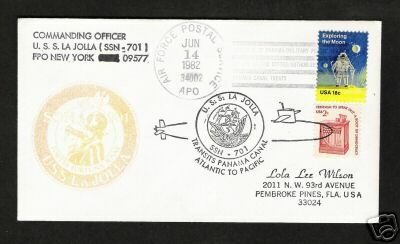 19k Commemorative post mark on the occasion of the La Jolla's (SSN-701) first Panama Canal transiting, Atlantic - Pacific, 14 June 1982. Courtesy of Jack Treutle (of blessed memory). 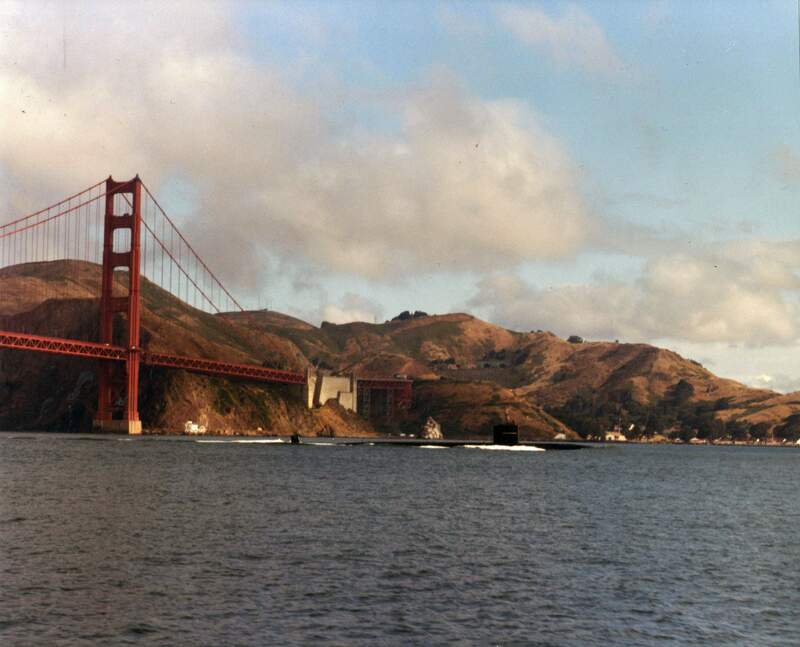 1.3m La Jolla (SSN-701) entering San Francisco Bay on 1 July 1982 on her way to Mare Island for her Post Shake Down Availability. USN photo # 189141-7-82 courtesy of Jim Stats and submitted by Darryl L. Baker. 888k Bow view of La Jolla (SSN-701) entering dry dock #3 at Mare Island for her Post Shake Down Availability. USN photo # 189130-7-82, courtesy of Jim Stats and submitted by Darryl L. Baker. 865k Stern view of La Jolla (SSN-701) entering dry dock #3 at Mare Island for her Post Shake Down Availability. USN photo # 189131-7-82, courtesy of Jim Stats and submitted by Darryl L. Baker. 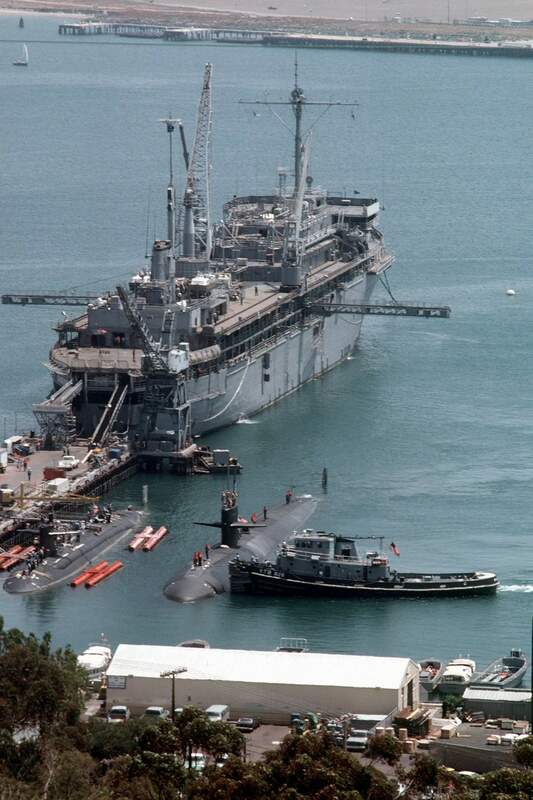 267k The large harbor tug YTB-826 nudges the nuclear-powered attack submarine La Jolla (SSN-701) into its berth at San Diego, circa 1983. In the background is the submarine tender Dixon (AS-37). I am pretty sure that 594 class sub pier side is the Plunger (SSN-595). USN photo # DN-ST-83-10231 by PH2 Randy Hays, from the Department of Defense Still Media Collection, courtesy of dodmedia.osd.mil. & submitted by Bill Gonyo. Photo i.d. courtesy of Bob Shouse. 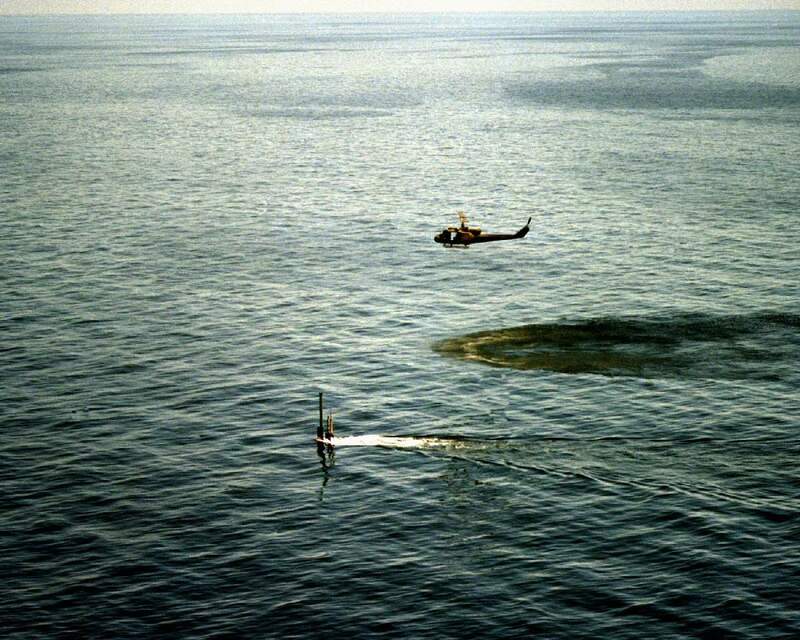 190k A UH-1 Iroquois helicopter flies over the nuclear-powered attack submarine La Jolla (SSN-701) during Tomahawk cruise missile tests on the Pacific Missile Test Center (PMTC) range on 16 April 1983. Photo # DN-SC-84-10062 by Gerry Winey from the Department of Defense Still Media Collection, courtesy of dodmedia.osd.mil. 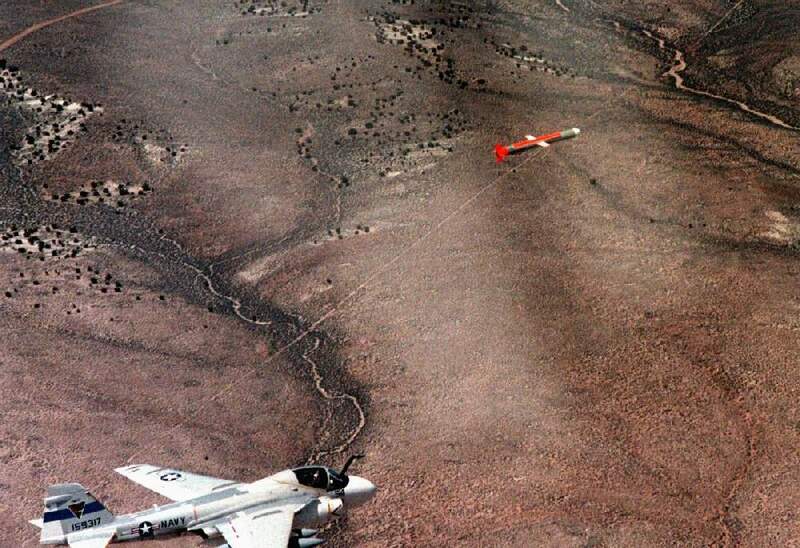 134k A Tomahawk cruise missile, launched from the nuclear-powered attack submarine La Jolla (SSN-701), is followed by an A-6 Intruder aircraft as it travels toward its target on the Tonapah Test Range in Nevada on 16 April 1983. Photo # DN-SC-84-10105 by LT Bob Struth from the Department of Defense Still Media Collection, courtesy of dodmedia.osd.mil. 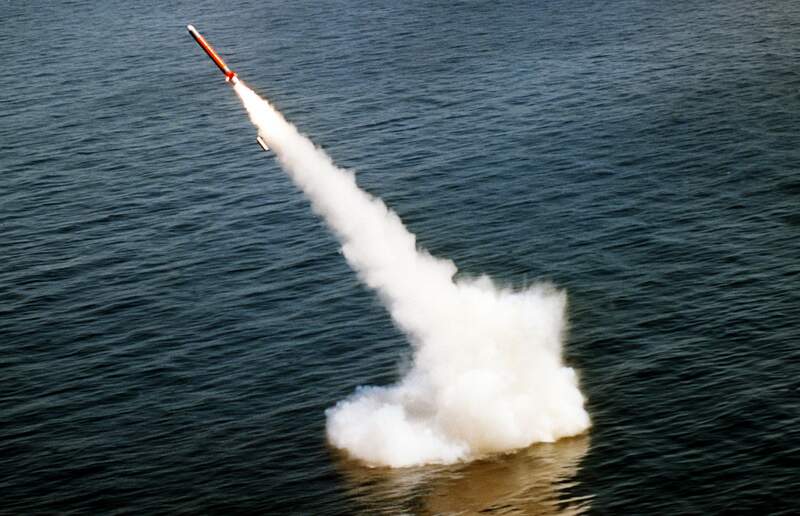 587k A Tomahawk cruise missile is launched from the nuclear-powered attack submarine La Jolla (SSN-701) on the Pacific Missile Test Center (PMTC) range, 29 April 1983. Photo # DN-SC-84-10113 by Jerry Winey, from the Department of Defense Still Media Collection, courtesy of dodmedia.osd.mil. 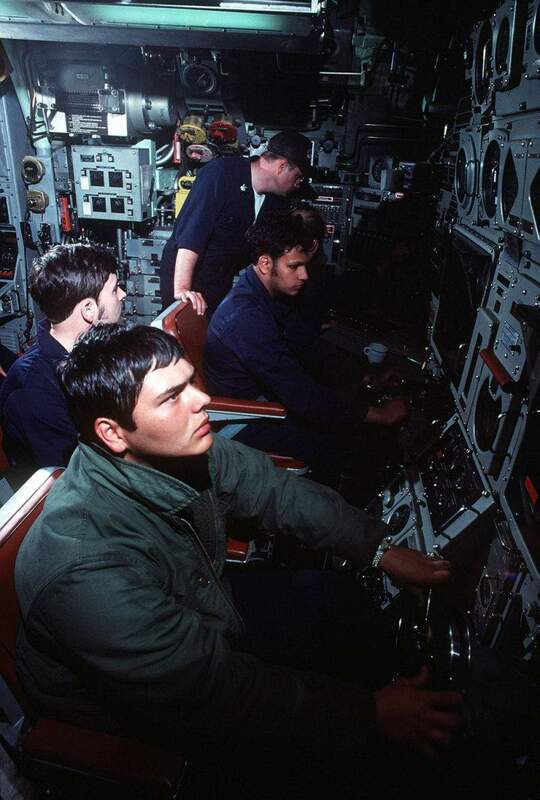 115k Crewmen aboard the nuclear-powered attack submarine La Jolla (SSN-701) control depth, bow angle and speed during their underway watches in the control room on 1 July 1983. Photo # DN-ST-83-10216 by PH 1 James Wallace, from the Department of Defense Still Media Collection, courtesy of dodmedia.osd.mil. & submitted by Bill Gonyo. 47k Spaghetti and pizza are served for dinner aboard the nuclear-powered attack submarine La Jolla (SSN-701). 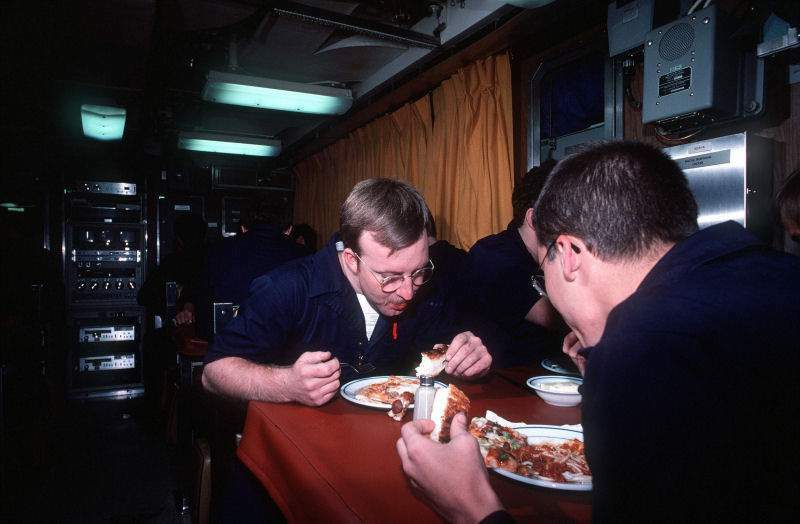 The 130-man crew eats in shifts on the 30-man mess deck. Photo # DN-ST-83-10220 by PH 1 James Wallace, from the Department of Defense Still Media Collection, courtesy of dodmedia.osd.mil. & submitted by Bill Gonyo. 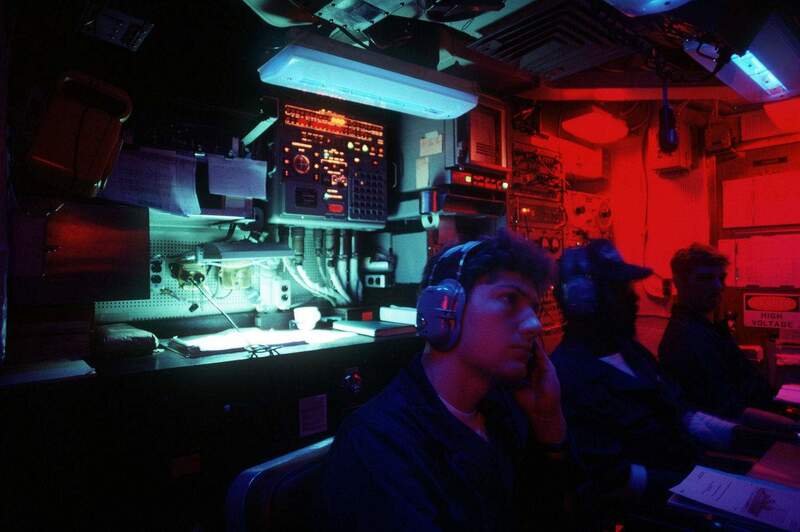 107k Sonar technicians man their underway watch stations at the sonar console aboard the Los Angeles class nuclear-powered attack submarine La Jolla (SSN-701) on 1 July 1983. Photo # DN-ST-83-10214 by PH 1 James Wallace, from the Department of Defense Still Media Collection, courtesy of dodmedia.osd.mil. & submitted by Bill Gonyo. 72k A submariner goes down a vertical ladder aboard the nuclear-powered attack submarine La Jolla (SSN-701). 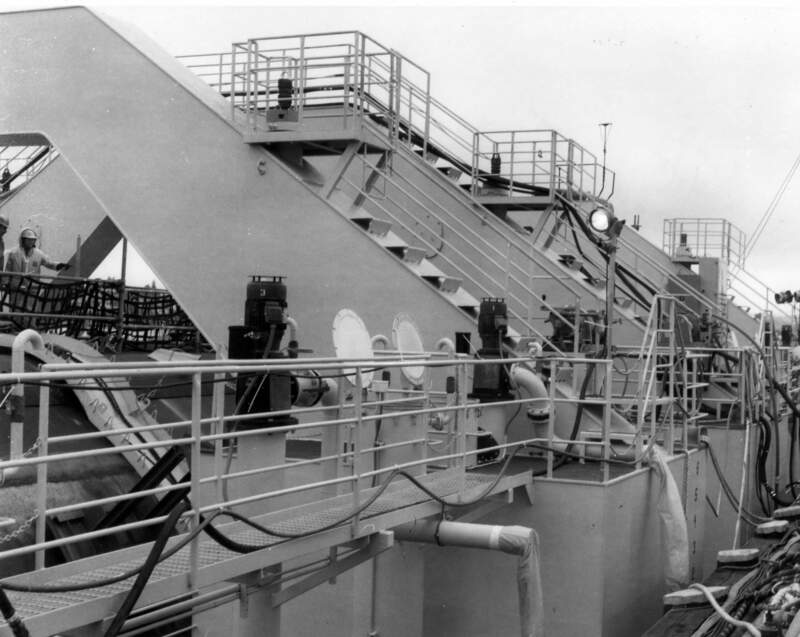 With space limited, submarines are equipped with deck-mounted hatches and vertical ladders. Photo # DN-ST-83-10221 by PH 1 James Wallace, from the Department of Defense Still Media Collection, courtesy of dodmedia.osd.mil. & submitted by Bill Gonyo. 1.22k Twenty four page Welcome Aboard PDF of La Jolla (SSN-701), circa 1985. Photos courtesy of Scott Koen & ussnewyork.com. 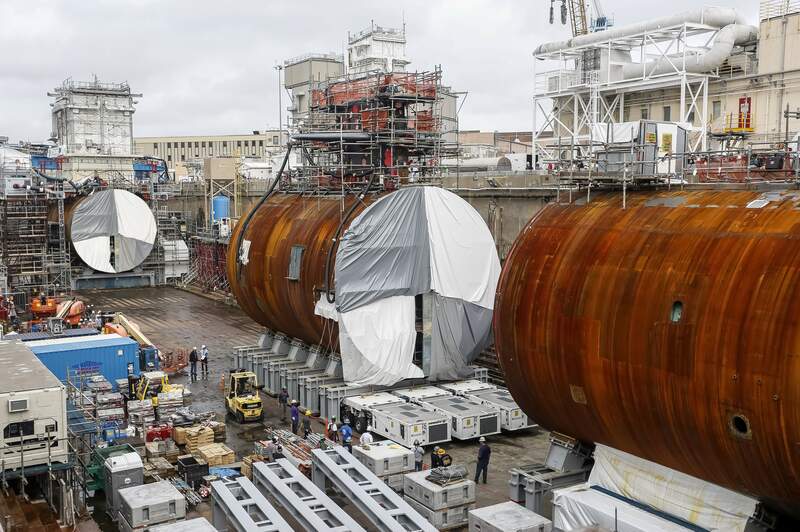 931k Mare Island built Buoyancy Assistance Modules (BAMS) were used to float 637 & 688 class submarines into dry dock #4 at the yard. Dock 4 is the smallest dry dock at Mare Island. These BAMS are now used at Pearl Harbor for the same purpose. 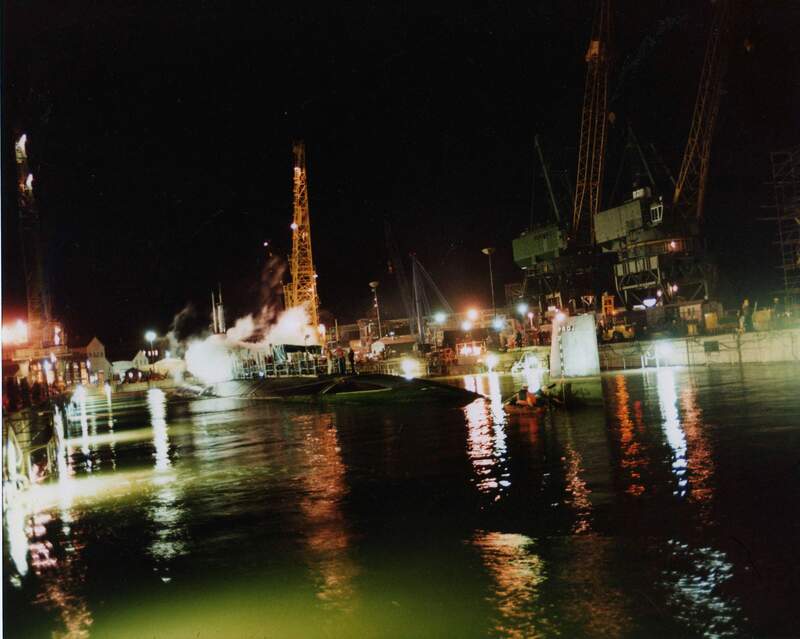 This BAMS is aft of the sail of the La Jolla (SSN-701) during her docking at Mare Island on 7 March 1989. USN photo courtesy of Darryl L. Baker. 980k This BAMS is forward of the sail of the La Jolla (SSN-701) during her docking at Mare Island on 7 March 1989. USN photo courtesy of Darryl L. Baker. 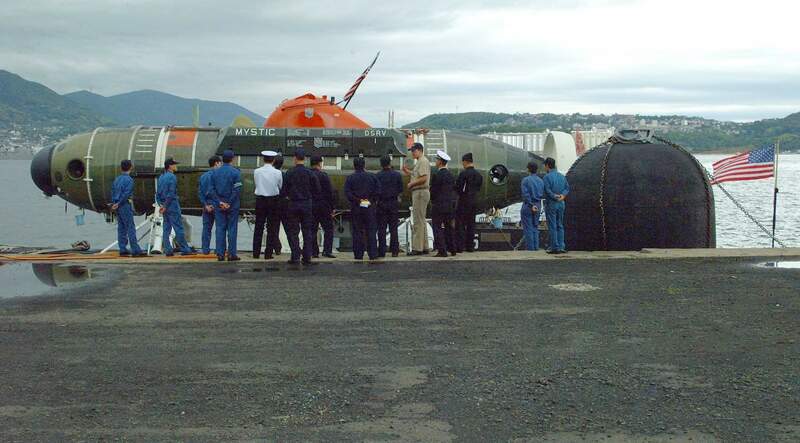 158k LT Mike Campfield, assigned to the Los Angeles class attack submarine La Jolla (SSN-701), explains the capabilities of the deep submergence rescue vehicle Mystic (DSRV-1), to naval officers from the Japanese Maritime Self Defense Force at Sasebo, Japan, 23 April 2002. La Jolla and Mystic will operate with surface ships and submarines from the U.S., Japan, Australia, the Republic of Korea and the Republic of Singapore during Pacific Reach 2002. 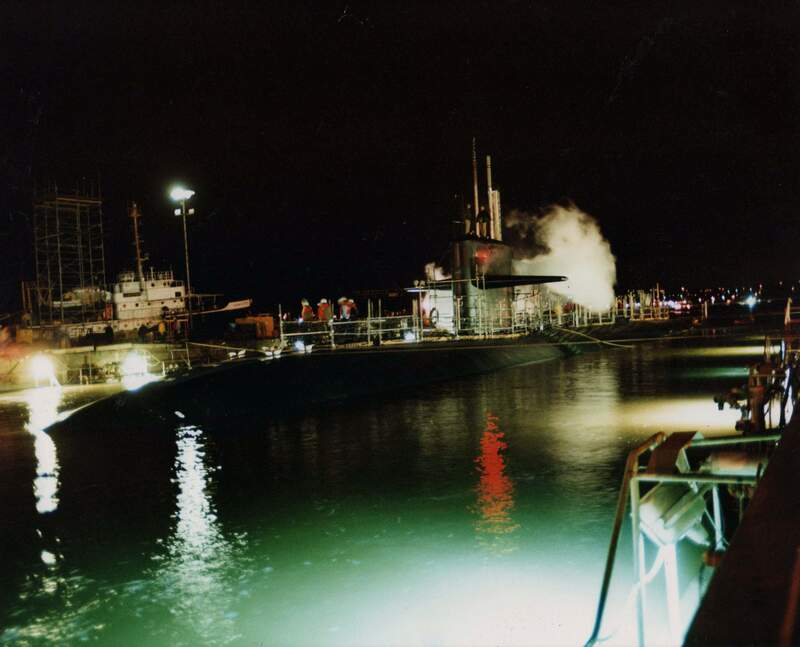 Mystic was specifically designed to fill the need for an improved means of rescuing the crew of a submarine immobilized on the ocean floor. 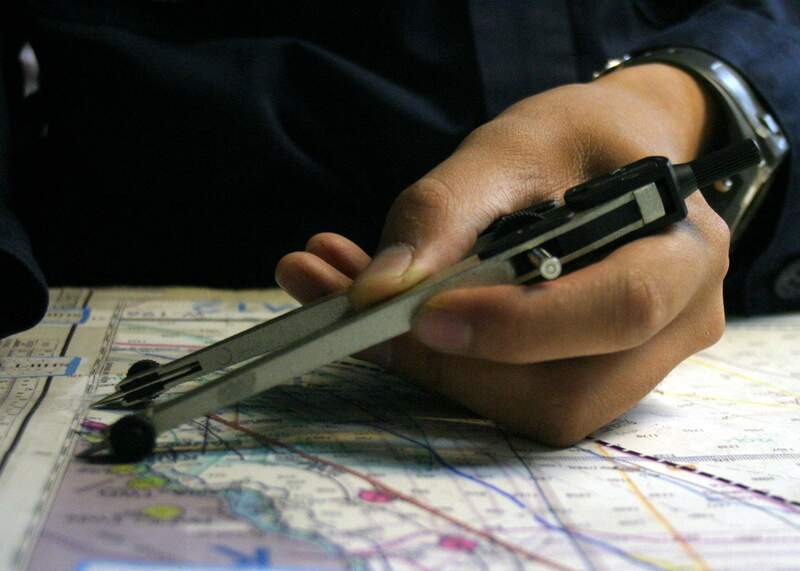 It can operate independently of surface conditions or under ice for rapid response to an accident anywhere in the world. USN photo # N-0401E-001 by Journalist 3rd Class Wes Eplen, courtesy of CHINFO Chief of Naval Information. Partial text contributed by former ET1 (SS) Eric A. Schwarz. 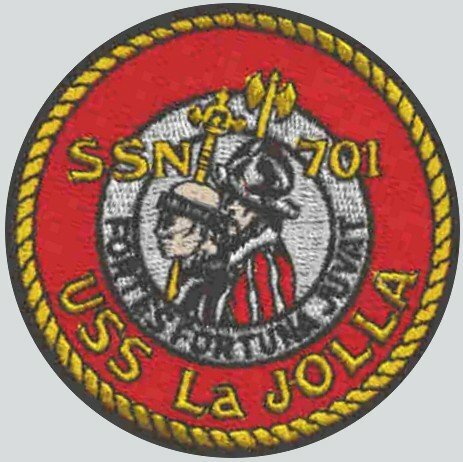 1.07k Fourteen page COC PDF of La Jolla (SSN-701), covering CDR. Sawyer, 2001. Photos courtesy of Scott Koen & ussnewyork.com. 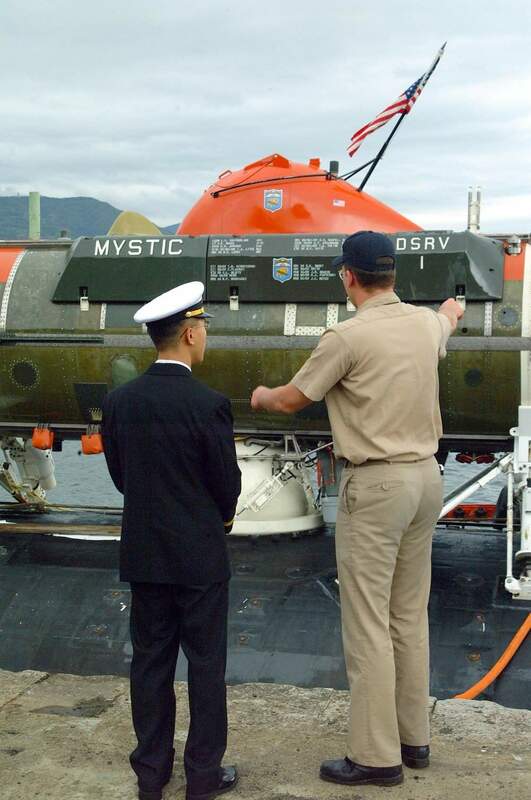 150k LT Mike Campfield, assigned to the La Jolla (SSN-701) explains the capabilities of the deep submergence rescue vehicle Mystic (DSRV-1), to a naval officer from the Japanese Maritime Self Defense Force at Sasebo, Japan, 23 April 2002. 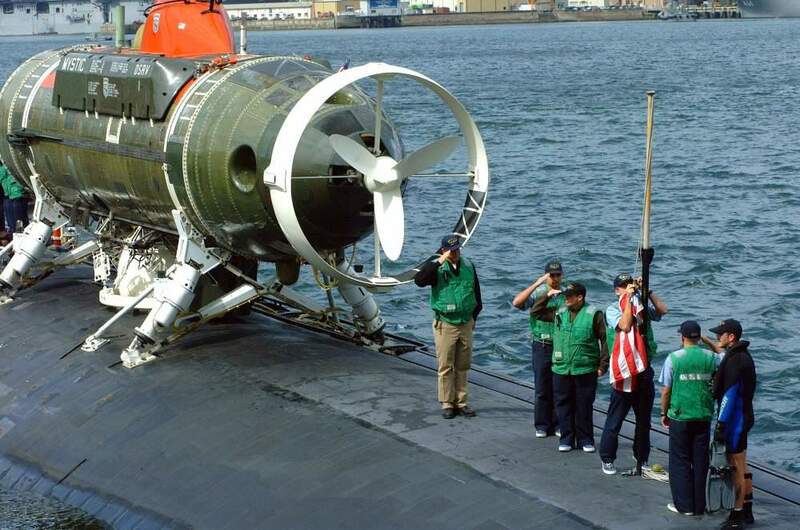 USN photo # N-0401E-002 by Journalist 3rd Class Wes Eplen, courtesy of CHINFO Chief of Naval Information. Partial text contributed by former ET1 (SS) Eric A. Schwarz. 152k La Jolla (SSN-701), with the Deep Submergence Rescue Vehicle Mystic (DSRV-1) mounted aft, pulls out of Sasebo harbor to participate in the submarine rescue exercise Pacific Reach 2002 on 25 April. USN photo courtesy of CHINFO Chief of Naval Information. 105k The La Jolla (SSN-701) with the deep submergence rescue vehicle Mystic (DSRV-1) attached, lowers the National Ensign as it prepares to get underway to participate in the submarine rescue Pacific Reach 2002 at Sasebo, Japan, 25 April 2002. The sailors are, from left to right: ENS Mike Svatek, ET3(SS) Jesse Valles, ET3 (SU) Comilang, ELT2(SS) Stephen Guier (removing the ensign), ET2(SS) Franklin, EM2(SS/DV) James Patterson (in dive gear). USN photo # N-0401E-001, by Journalist 3rd Class Wes Eplen, courtesy of CHINFO Chief of Naval Information. Partial text contributed by former ET1 (SS) Eric A. Schwarz. 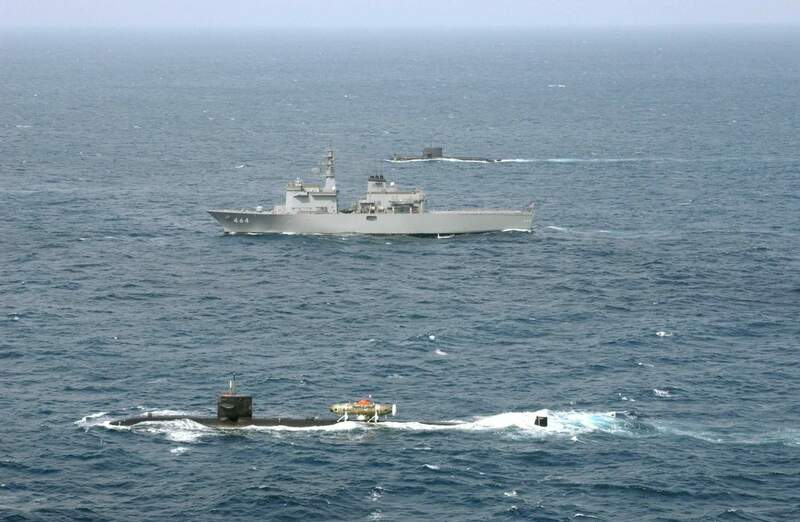 174k The La Jolla (SSN-701) with the Mystic (DSRV-1) attached, steams in formation with the Japanese Maritime Self Defense Force (JMSDF) command and control ship, JDS Bungo (MST 464) (middle), and the Royal Australian submarine, HMAS Farncomb (74) (top), during exercise Pacific Reach 2002 off the Coast of Kyushu Island, Japan, 26 April 2002. USN photo # N-0000X-006 courtesy of CHINFO Chief of Naval Information. 186k The La Jolla (SSN-701) with the Mystic (DSRV-1) attached, steams to its operating area with the Japanese Maritime Self Defense Force (JMSDF) command and control ship, JDS Bungo (MST-464) during exercise Pacific Reach 2002 off the Coast of Kyushu Island, Japan, 26 April 2002. USN photo # N-0000X-003 courtesy of CHINFO Chief of Naval Information. 268k Rear Adm. John B. Padgett III, Commander, Submarine Forces U.S. Pacific Fleet (COMSUBPAC), Rear Adm. Paul F. Sullivan, and Adm. Walter F. Doran, Commander, U.S. Pacific Fleet, bow their heads on board the La Jolla (SSN-701) during the Invocation by Capt. Nathaniel Milton, Chaplain, at the COMSUBPAC Change of Command Ceremony, at Pearl Harbor, Hawaii 7 August 2003. USN photo # N-7833F-019 by Photographer's Mate 3rd Class Adan Fabela III, courtesy of news.navy.mil. 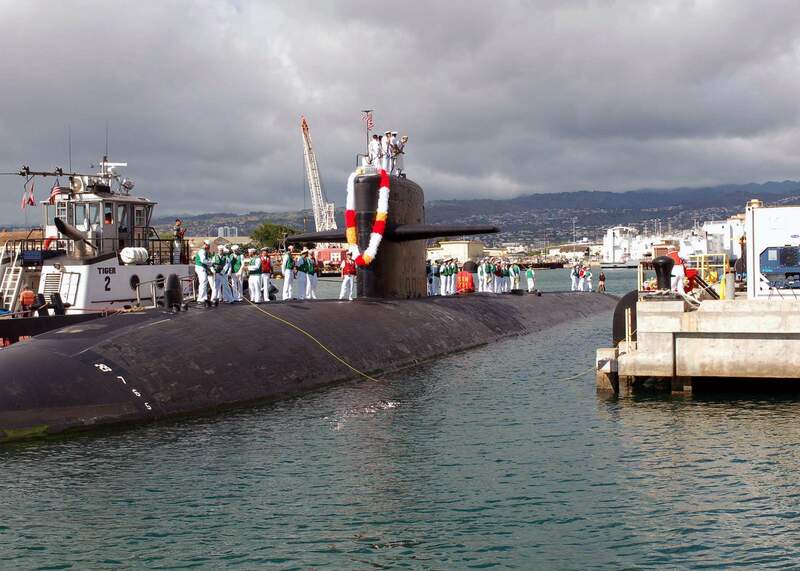 234k A warm "aloha" and a tug gently guide the La Jolla (SSN-701) as the attack submarine returned home to the Pearl Harbor Naval Station submarine piers on 23 August after completing six-month deployment to the Western Pacific. Over the last six months, the nuclear attack submarine traveled over 34,000 nautical miles, equivalent to circling the globe three times.La Jolla conducted 11 port visits including Korea, Japan, Singapore, Saipan and Guam, and participated in five international exercises including the multi-national submarine rescue exercise Pacific Reach 2004 and operations in support of Commander, U.S. Seventh Fleet. USN photo by Journalist 3rd Class Corwin Colbert, courtesy of news.navy.mil. 239k Sailors assigned to the Los Angeles class attack submarine La Jolla (SSN-701), mark positions on a chart in the submarine's control room at Pearl Harbor, Hawaii 4 July 2005. 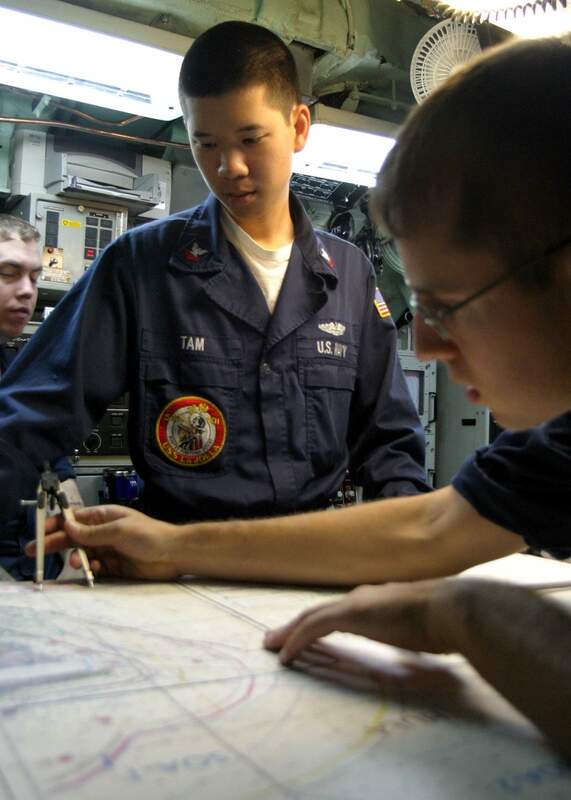 The Pacific Fleet Submarine Force announced in June that all submarine navigation Electronics Technicians must now quality as Assistant Navigator (ANAV). 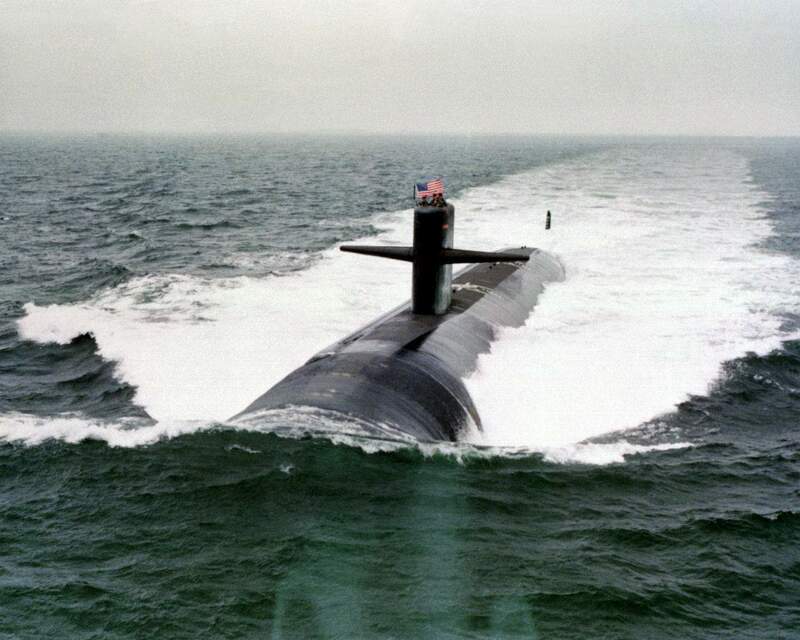 The ultimate goal is for the entire submarine force, including ballistic missile submarines (SSBN), the newly converted guided-missile submarines (SSGN), Los Angeles class, Seawolf class and Virginia class attack submarines (SSN) to be certified for electronic navigation in the 2009 time frame. USN photo # N-0879R-009 by JOC(SW/AW) David Rush, courtesy of news.navy.mil. 266k A member of the La Jolla's (SSN-701) navigation team checking the boats proposed route off the coast of Oahu, July 2005. USN photo by JOC(SW/AW) David Rush, courtesy of Jack Treutle (of blessed memory). 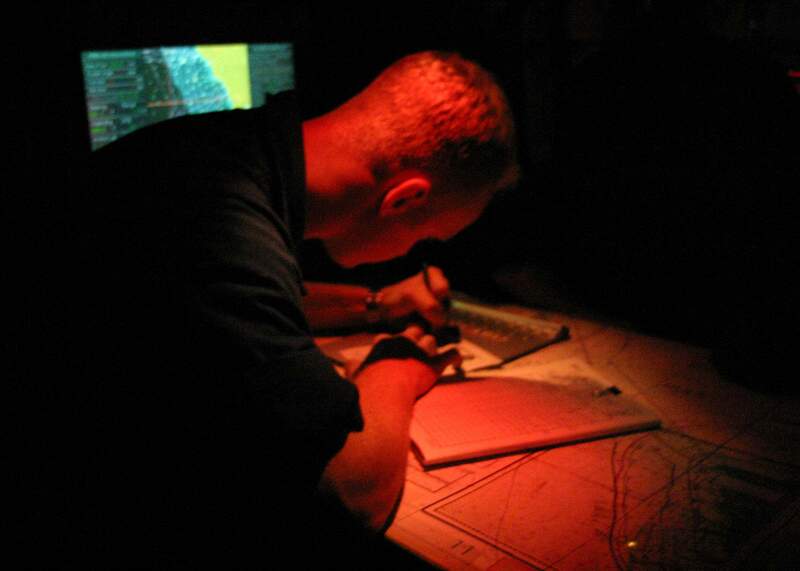 229k A member of the La Jolla's (SSN-701) navigation team checking the boats proposed route off the coast of Oahu, July 2005. USN photo by JOC(SW/AW) David Rush, courtesy of Jack Treutle (of blessed memory). 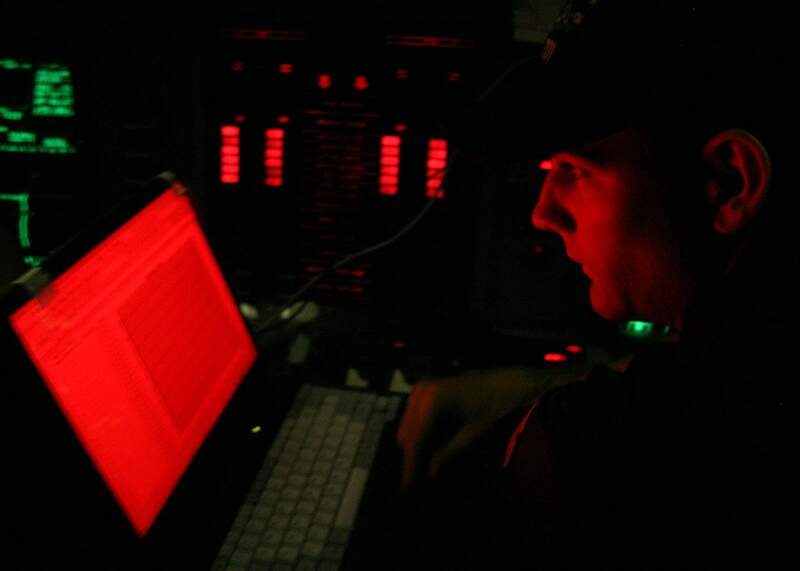 136k On duty aboard the La Jolla (SSN-701), off the coast of Oahu, July 2005. USN photo by JOC(SW/AW) David Rush, courtesy of Jack Treutle (of blessed memory). 67k On 5 January 2006, Capt. 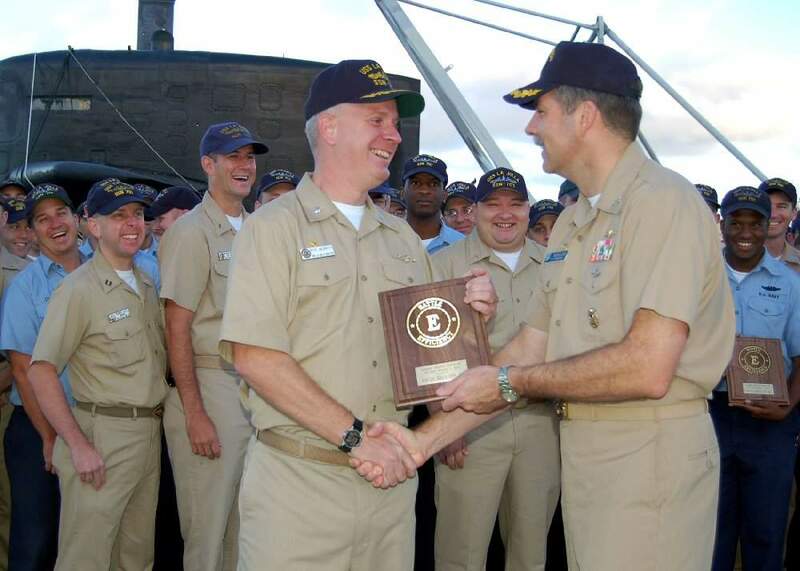 Michael Zieser, Commodore, Submarine Squadron One, presented the Battle "E" award to Cmdr. 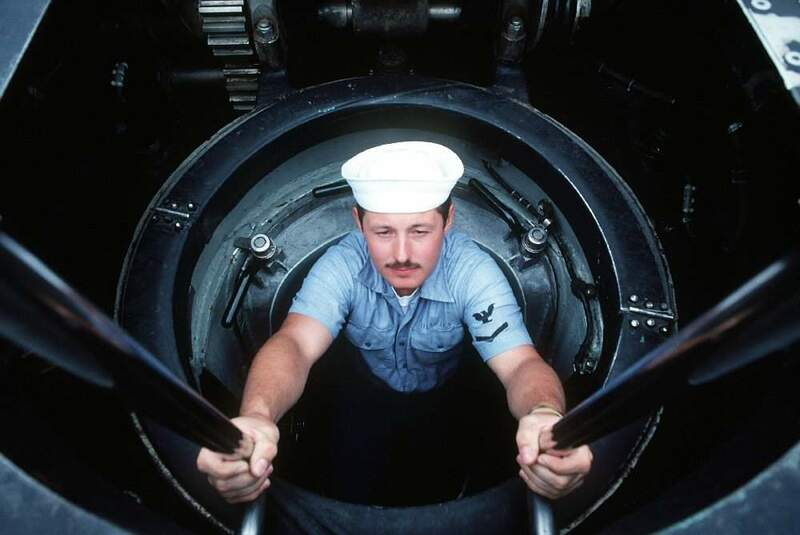 Nelson Hildreth,La Jolla's (SSN-701) commanding officer. 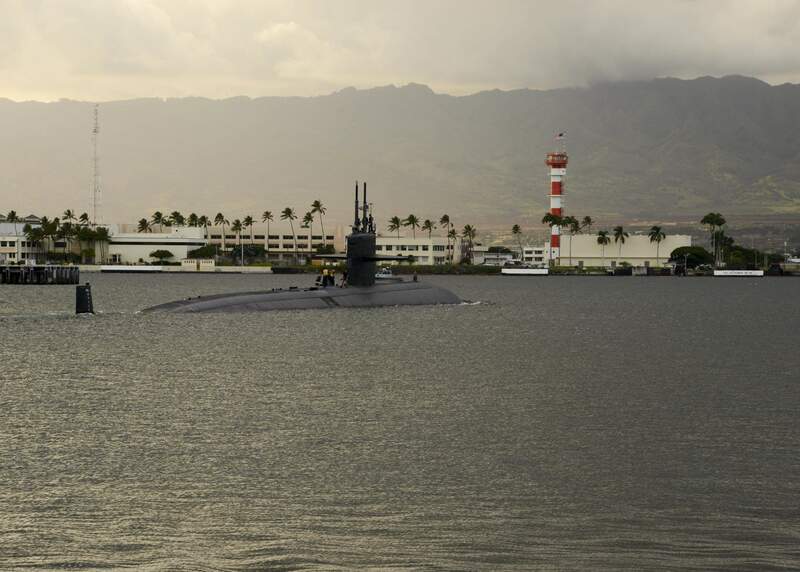 Three nuclear-powered attack submarines homeported in Pearl Harbor were among the submarines selected for the award. They included La Jolla, Submarine Squadron One; Columbia (SSN-771) Submarine Squadron Three; and Cheyenne (SSN-773), Submarine Squadron Seven. USN photo # DN-SC-82-05950 by JOC(SW/AW) David Rush, courtesy of COMSUBPAC Public Affairs & submitted by Bill Gonyo. 389k Submarine tender Frank Cable (AS-40) tends deployed submarines Honolulu (SSN-718) and La Jolla (SSN-701) while anchored in Hong Kong Harbor on 7 October 2006. 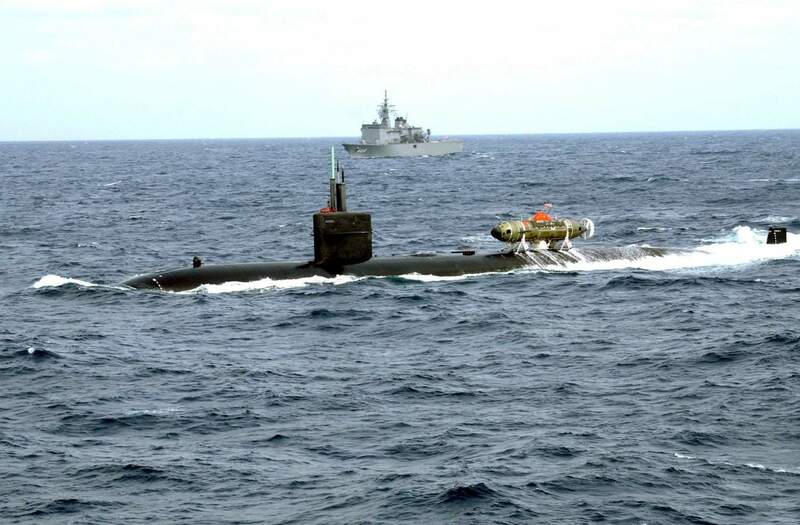 The tender's presence made it possible for the two submarines to make a port visit to the Asian metropolis as United States submarines cannot moor to the mainland. This is one of the last Western Pacific port visits Honolulu will make before returning to Bremerton, Wash., to begin decommissioning. USN photo # N-3228J-002 by Mass Communication Specialist 1st Class Jeremy Johnson, courtesy of news.navy.mil. 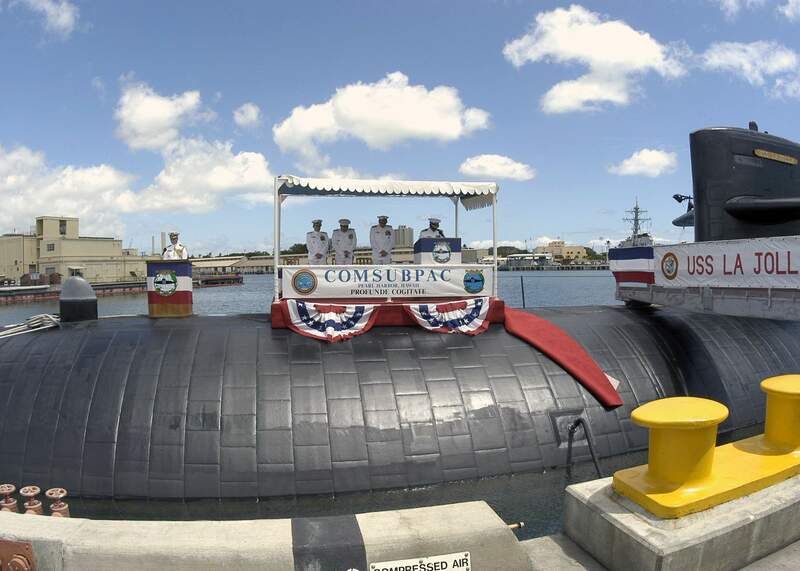 366k The fast attack submarine La Jolla (SSN-701) returns to Naval Station Pearl Harbor from a six-month deployment to the western Pacific Ocean on 03 October 2008. USN photo # N-2218M-002 by Mass Communication Specialist Seaman Luciano Marano, courtesy of news.navy.mil. via Bill Gonyo. 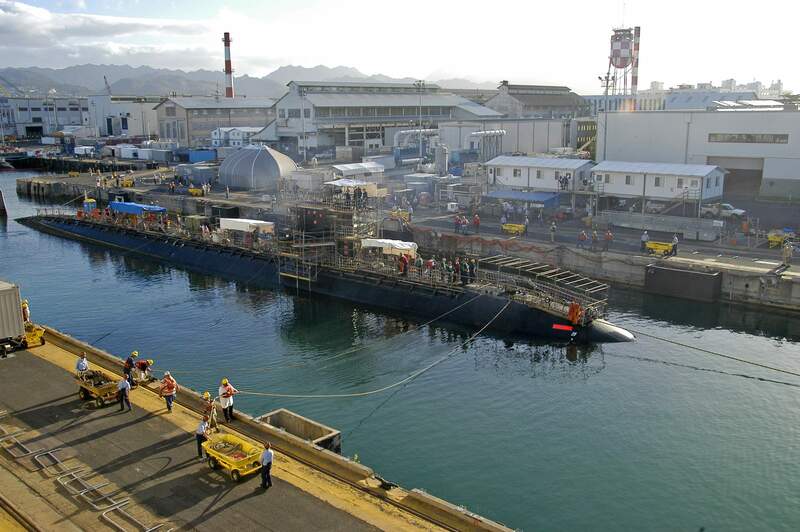 665k The attack submarine La Jolla (SSN-701) is in Dry Dock 1 at Pearl Harbor Naval Shipyard, 21 January 2009. USN photo # N-0676F-651 by Marshall Fukuki. 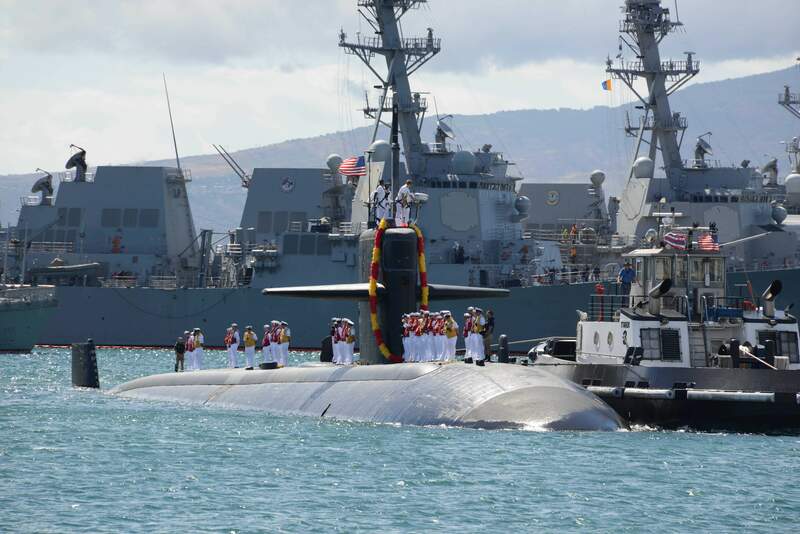 1.86k The La Jolla (SSN-701) returns to Joint Base Pearl Harbor-Hickam after completion of its final scheduled six-month deployment to the western Pacific Ocean, 3 September 2014. USN photo # 140903-N-CB621-178 by Mass Communication Specialist 1st Class Jason Swink courtesy of news.navy.mil. via Ron Reeves (of blessed memory). 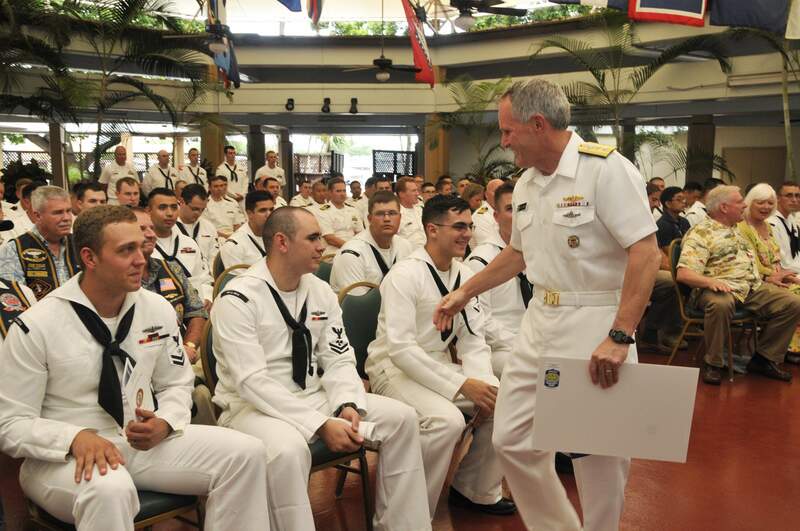 980k Rear Adm. Phil Sawyer, commander of Submarine Force, U.S. Pacific Fleet, thanks Sailors assigned to the La Jolla (SSN-701) for their service at a change of homeport ceremony for the submarine at Joint Base Pearl Harbor-Hickam, 14 October 2014. USN photo # 140903-N-CB621-178 by Mass Communication Specialist 1st Class Steven Khor courtesy of news.navy.mil. via Ron Reeves (of blessed memory). 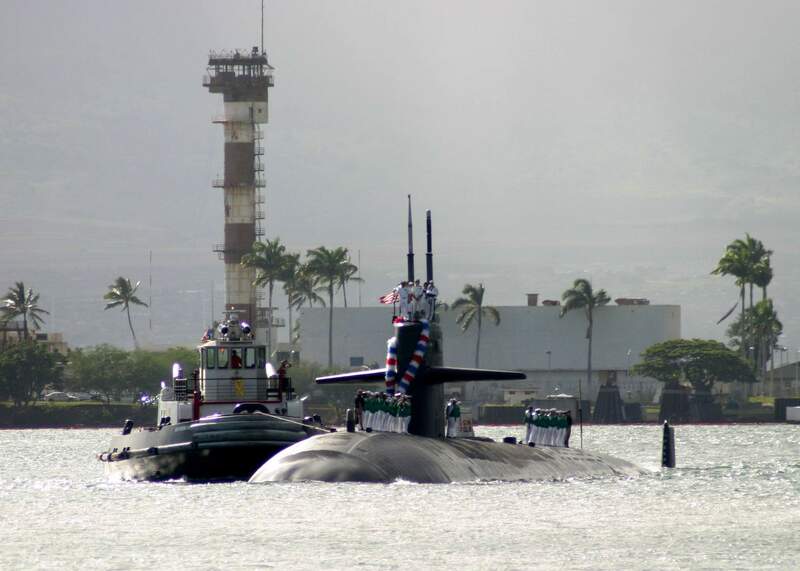 1.56k The fast attack submarine La Jolla (SSN-701) departs the submarine piers at Joint Base Pearl Harbor-Hickam for the last time, 15 on October 2014. 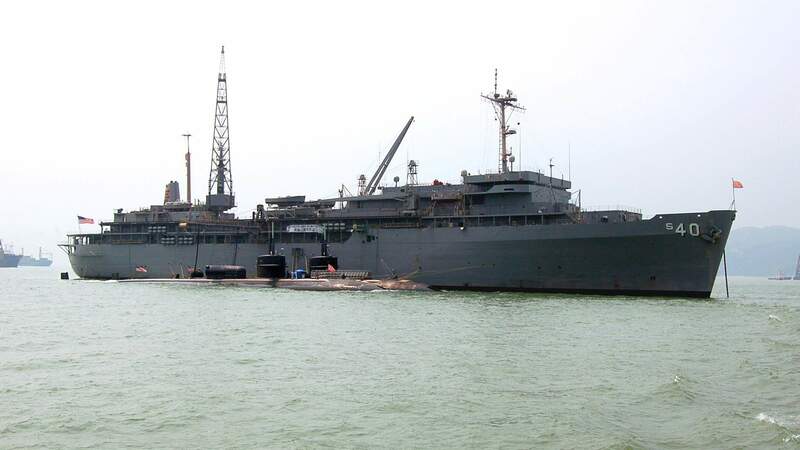 After 34 years of commissioned service, with the last 14 years based at Pearl Harbor, La Jolla is scheduled to be decommissioned and converted to a moored training ship, serving as a training platform for nuclear power training at Naval Support Activity Charleston in South Carolina. USN photo # 141015-N-CB621-057 by Mass Communication Specialist 1st Class Jason Swink courtesy of news.navy.mil. via Ron Reeves (of blessed memory). 2.51k La Jolla (SSN-701) is undergoing conversion from an operational fast-attack submarine into a Moored Training Ship (MTS) at Norfolk Naval Shipyard in Portsmouth, Virginia, 29 September 2015. With two cuts made and La Jolla now separated into three pieces, three new hull sections will be added to the boat, adding 76 feet in length. USN photo # 150929-N-MA158-004 by Shayne Hensley courtesy of news.navy.mil. via Ron Reeves (of blessed memory) & wikipedia.org. There is no DANFS History currently available for La Jolla (SSN-701) at the Haze Gray & Underway Web Site, the main archive for the DANFS Online Project.